I'm terrified of so many things on this earth. Truly. Ask my parents and they will most likely tell you that never in a million years would they have imagined I'd end up living in a foreign country, working in a profession that has zero stability and, in fact, requires constant reinvention. What can I say? Over the past two decades I've made a concerted effort to kill all fear, all the while being petrified. This past week I was thrown another curveball. Last Monday I received an invitation to ride as a passenger in the supercar display at the Goodwood Festival of Speed with Ferrari. Naturally, I got the email and responded with an instant "hell, yes, I'll be there." Five minutes later the reality of the situation set in. While I adore beautiful supercars and the power and speed that come with them, I much prefer to be the one behind the wheel controlling such a beast. I am, in short, the worst passenger in existence - always have been, always will be. Planes- can't stand them. I want to be the pilot. Helicopters - yeah, them too. Even when it comes to boats, if someone else is at the helm, I'll have a near panic attack. Only no one ever sees this. Naturally, it's all hidden away in a nice little Crocodile skin vanity case, deep within my soul. 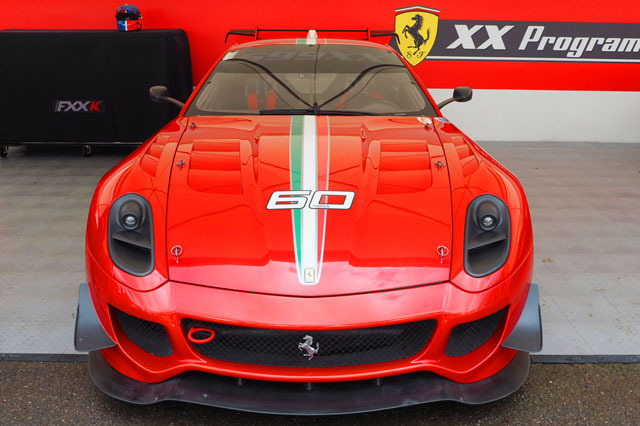 But it's there and the thought of sitting as a passenger, while a professional racing driver sweeps me around a track at 140 miles an hour in one of the world's most beloved Ferrari models (the 599xx), might as well have thrown that box clear across the room. The hinges were officially off. No one knew. I was cool as a cucumber. We took a helicopter down to Goodwood in the early morning hours- no problems there, just beautiful views of green rolling hills- and arrived at the Ferrari supercar paddocks with time to spare. We were introduced to our cars. Hello, Ferrari 599xx, which I had to travel in as I was too tall to be comfortable in the other models on offer- won't hear me complaining. From there we were fitted with our helmets and before I even had time to register a fear, I was buckled into my seat, the swish Ferrari red belts screaming "don't worry, you're in a luxury bubble here." At this point I had more excitement than fear and absolutely no idea what to expect. Of course I knew the Hillclimb at Goodwood was one of most famous tracks in the world - renowned for showcasing the best the universe has to offer when it comes to fine automobiles. But, only a very few in this world get to see what it's like to drive this track, in a supercar, with thousands of people cheering, taking pictures and begging you to go faster or rev your engine just one more time before you move on. I had no idea what was in store. We made our way to the starting line and my driver, a lovely chap named James, who I do so hope I meet again, informed me that he would not actually be driving me around the track. This man who has just assured me that all would be OK, that I would have a great time and that I would be in safe hands, was leaving me. WTF? Yes, queue the panic. James stepped out of the vehicle at the start line and in slipped James Calado. Familiar with this chap? He's a big deal on the racing circuit and had just come from racing in Le Mans - another legendary event in which the drivers race for 24 hours. I kid you not, he got in the car and received instructions on how to drive it. I took out my iPhone and whatsapped everyone I loved - "I'm about to take off in the Ferrari. In case anything happens, I love you and I've lived a great life." True story. The first "zero to some insane speed" off the starting line was where it all changed. With my helmet on and belts tightly fastened, we took off like a rocket ship. Fear flooded every inch of my skin and seconds letter was replaced by an incomprehensible exhilaration. I had spent a week worrying about 2 and a half minutes that I asked to do over again the moment I stepped out of the car. "Again, again," I cried. But, alas, this is a once in a lifetime opportunity and I can't help but think about the fact that I almost said no. I almost said no right up until the moment we took off. I nearly offered the ride to someone else. There's a lesson here, that I do believe most Ferrari owners themselves have mastered a hundred times over- otherwise how would they be successful enough to own the beautiful toys they do? The lesson is this: recognise fear and then tell it, face to face, that you're coming for it and do it. Feel it and seal it, people. Note of thanks: Ferrari - you remain a legend in my mind. 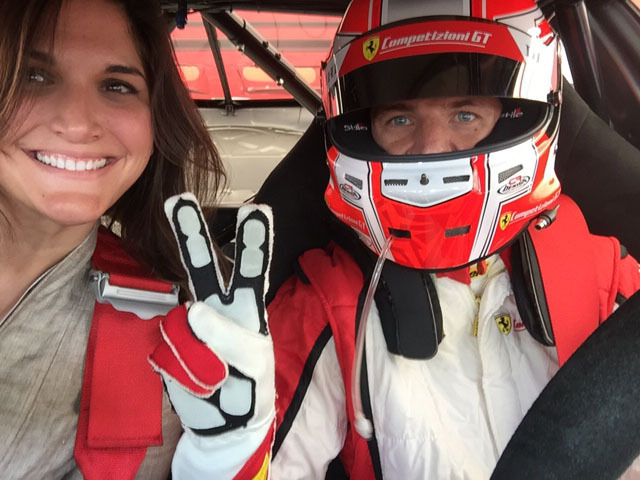 The fact that I had a chance to not only be a part of such an incredible day, but also to ride in a Ferrari 599xx, will forever seem like a dream I once had. This video is the only proof I have for myself that it happened at all.